The Wenro were a small tribe of somewhere between 1,200 and 2,000 people who lived in an unknown number of villages. From the pattern of their dispersal in 1639, there were probably either two or three villages in total - not a great amount. The Wenro ceased to exist as a tribe in 1643. Any descendents would be found among the Iroquois, the Seneca of Oklahoma, or possibly the Wyandot (a later name applied to Huron remnants. 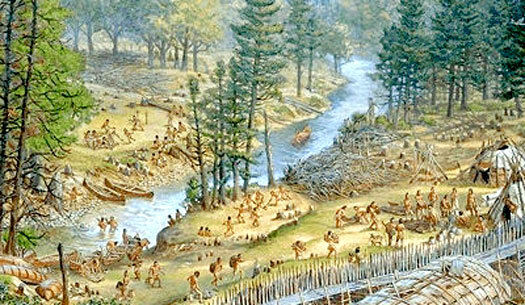 What little is known about the Wenro has come down to us from the Huron, since there was no direct contact between the Wenro and Europeans until after a large group of Wenro refugees came to the Huron villages in 1639. Oil was highly prized by the Iroquoian tribes in the region for its medicinal properties, and the trade for this commodity was the major reason the Wenro maintained good relations with the Huron. 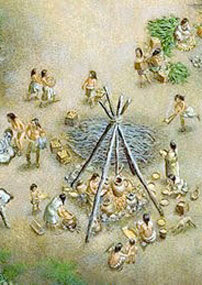 It can safely be presumed that the Wenro lived in a manner very much like their other Iroquoian neighbours. If true, they farmed extensively (corn, beans, and squash) with hunting, gathering, and fishing providing the remainder of their diet. Political and social organisation are unknown, but since all other Iroquoian people traced their descent through the mother, it is probable that the Wenro did also. None of their village sites have been specifically identified, so a certain amount of guesswork is involved in deducing the tribe's composition. However, the use of large longhouses was common, and this was what was used by the Iroquois who lived in the area after the Wenro had been scattered. It is not known whether their villages were fortified, but considering their situation, this should have been the case. The history of the Wenro can be found in a separate feature (see sidebar links).